Today was Martin Luther King day. I had the day off of work. So I slept in and then I got ready, packed my gear and headed back out to the bison site. It was bright and sunny, but 40 degrees with the wind blowing hard. Thankfully I would be down in the creek and the wind would not be much of an issue. There were a few more exposed bones I wanted to collect. One exposed bone was long and thin. I thought it was part of a thoracic vertebra. Just to the right of it was the edge of a very wide and flat bone. The first bone lay diagonal across part of the top of the second bone. I began to remove dirt and realized the wide flat bone was very fragile and broken in many places. This was not going to turn out well for that bone. Here is a pic of the situation. I don't think you can see all the breaks, but they’re there. The long thin bone is to the left. It started about 1.5 to 2 cm wide and 0.5 thick, but quickly broaden and got thicker. I couldn’t tell what it was. I think both scapula may be present, but I didn’t expose them to try to figure that out. I assumed the wide flat bone was a scapula, but I’m not terribly familiar with bovid anatomy so I wasn’t completely sure how long and wide it was supposed to be. I kept digging back into the bank to excavate it, but it seemed unending and quite large. This is the cavity after digging a while. The humerus on the left and the scapula on the right. I think they were actually articulated together, but at a distorted angle. I traced the other bone back and hit another large bone behind it. I tried to go around the other side of the scapula to pedestal it, but I hit bone there too. I am a complete novice with using Butvar 76, but I had received some on Saturday in the mail. Before I left home I decided to make a 50% solution to use to hold stuff together in the field rather than the cyanoacrylate. I knew the bond wouldn’t be strong, but hoped it would help hold stuff in place for transporting back to my house. I knew the scapula was not going to go well at all. It was fractured in dozens of pieces. I chose to pour the 50% solution over it and let it dry before attempting to move it. I walked over to there the end of the tibia was sticking out of the bank. This is the end of it in pic below. The femur was at a 90 degrees angle to it and articulated. I removed the femur on 1/13, but knew I’d have to come back for the tibia. There was another bone to the right of the tibia. I couldn’t tell what it was until I removed it from the bank. It turned out very cute little caudal vertebra. Ugg it is telling me I cannot upload more pics. I sent myself 7 pics and chose 1.8 mb for size. I'll post more in a minute. Well, it is not letting me upload more. I've tried clearing and refreshing a few times. I'll be back after a while. It still isn't letting me upload anything. I have refreshed and cleared everything. I had this same problem with one of the bison posts last week. It is quite frustrating.  I'm ready for bed, but would like to finish this post, but may not be able to. I don't know how far above where you are digging before you are on the bank. 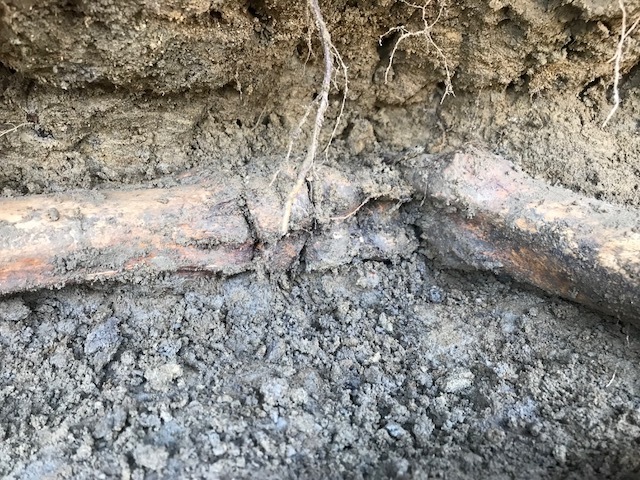 From the way the roots are hanging down...maybe only a couple of feet? It may be time to call up some beer drinking friends for an excavation session from above. It may end up being quicker and safer. As I stood looking at the tibia I scanned the bank further to the right. I saw something white about 12 feet away. I began to walk that direction, but stopped after about 3 feet. There was an area where part of the bank had collapsed and in the dirt from the collapse were several large bone fragments laying lose. I picked them up and then saw a few more pieces still buried in the dirt. They didn't pull out easily though so I left them and went to get a tool to dig them out with. You can see 3 pieces of bone sticking out above and to the left of the leaves. I circled it in red while I was waiting for the upload issue to resolve. The creek bed was very soft and muddy there. 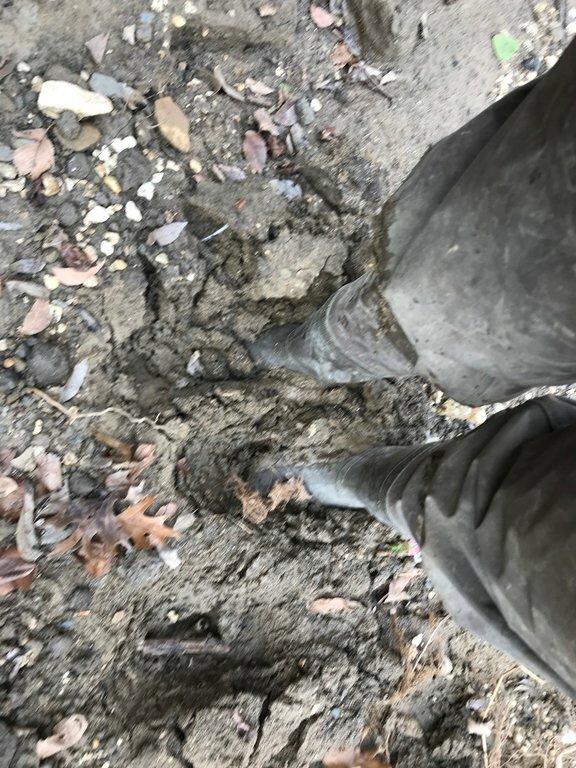 I had my waders on so I knelt down in the mud to dig the bones out. When I stood up to walk over to where my bag was my feet were buried in the mud. My feet in the mud. I had to pull hard. My boot felt like it would be pulled off, but my waders were strapped to my pants so I couldn’t let that happen. If the boot came of so did my pants. LOL Not going to happen. The mud wasn’t quite that deep or bad, but my boots kept sticking and it was a bit of a nuisance. I went back to poke around the collapsed mud some more to make sure nothing else was there. I didn’t find anything. So I started to walked over to the thing I had seen in the bank before I got distracted by the collapse. My boots were stuck again. I made it out and over to the thing in the bank. 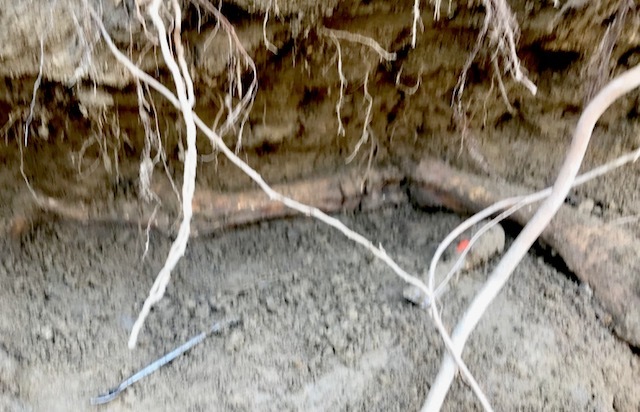 The collapse had left about a 1.5 foot overhang of soil and tree roots without anything underneath them for 8 or 9 feet. The piece was under the overhang. Oops, I circled the wrong thing. 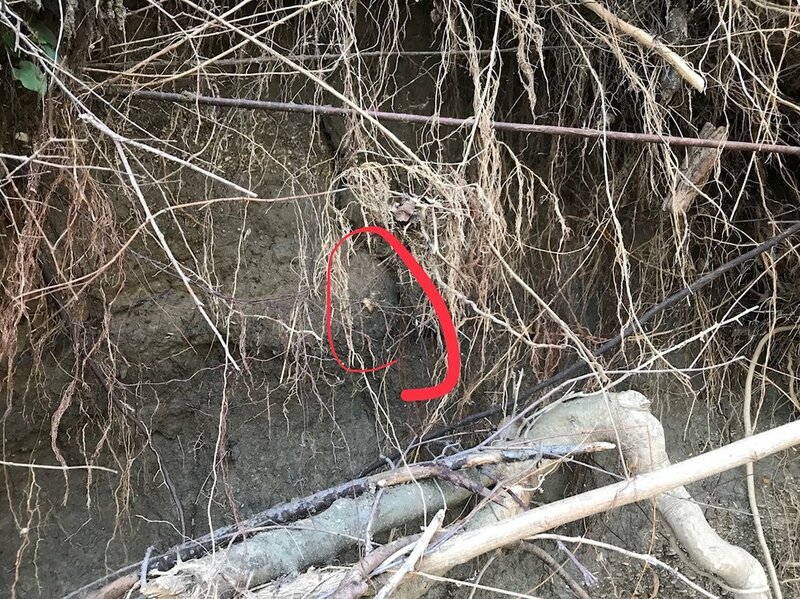 The circled thing ended up being a rock. It’s the little white thing in the top left, behind the roots, below the green leaf. It was a foot or ankle bone. I don’t know which. I put it in a tub I had. While there I saw another bone higher up, above my head, but further down the bank. It was far above the bone layer. It had to have been redeposited there during a flooding event. It was also in an area with roots overhanging without much else there. It was an avalanche risk. But it looked reasonably stable at the moment. I climbed up the bank a little to retrieved the bone. It was a medium sized lower leg bone, like a carpal or a phalange. It went into the tub. I'll shorten the story a bit. I went back and dug around the other larger bone. I determined it had to be a humerus. I had taken a radius from right near there the first night. I had broken the ulna off that night. In the dark. It was about then that I thought I should call it a night. I thought I had retrieved it right after I broke it, but I remembered now that what pulled out was a rib fragment not the ulna so I thought I’d get it later. Then I forgot about it until today. But I had no idea what a bovid ulna looked like so when I got it out I still didn’t know what it was. Human radius and ulna are pretty similar except the ulna is longer and the end is a bit different. Bovid ulnas look nothing like the radius and nothing like a human ulna at all. 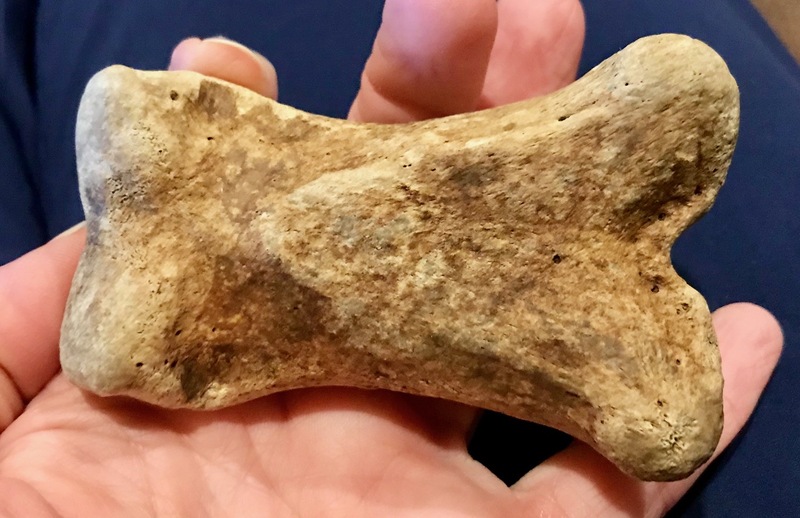 So only after I got home did I figure it out and solve the ID of another mystery bone I had, the other was the 2nd ulna, or the first since I found it first. 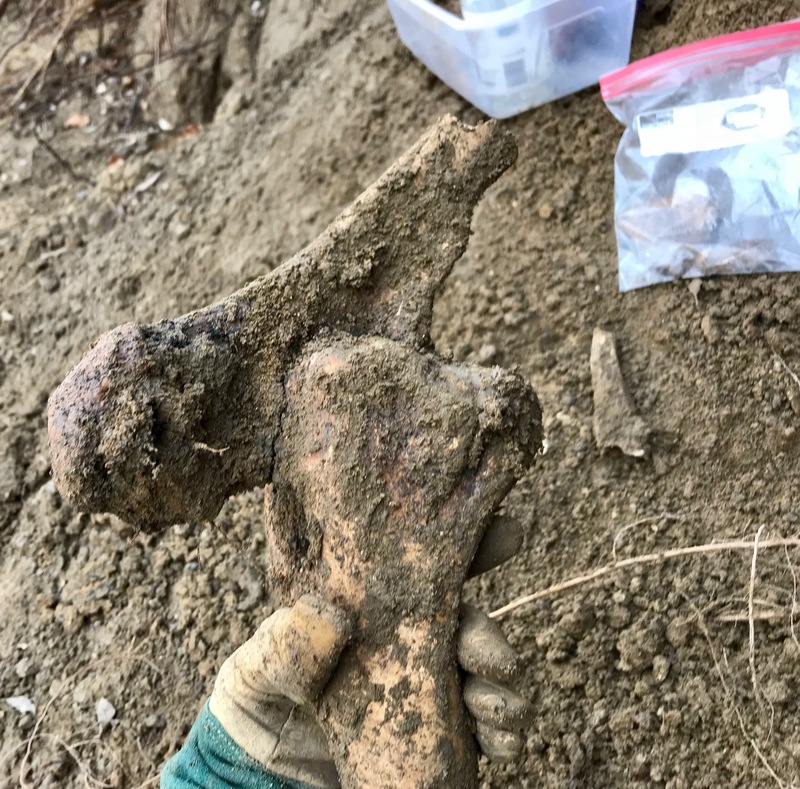 I won’t go into the detail of getting the humerus out, but it was a challenge since it was perpendicular to the bank and I had to dig all the way back into the bank to dig out the head of the humerus. I didn’t make the cavity tall enough as I dug so I didn’t have much working room. Humeri are huge, much larger than the femur head in terms of solid bulky mass. This is the humerus when I first got it out. The ulna is still articulated in place. At least that is how I think it is supposed to be except this is the small end of the humerus. It is upside down here to show the ulna. The fragment on the ground is to the end of the ulna. Here is the whole humerus upright with the ulna at the bottom where it belongs. I dislodged the ulna and wrapped it in foil with a fragment that broke off the end at the very beginning. It may have broken the first night I was there. I wrapped the humerus in foil too. 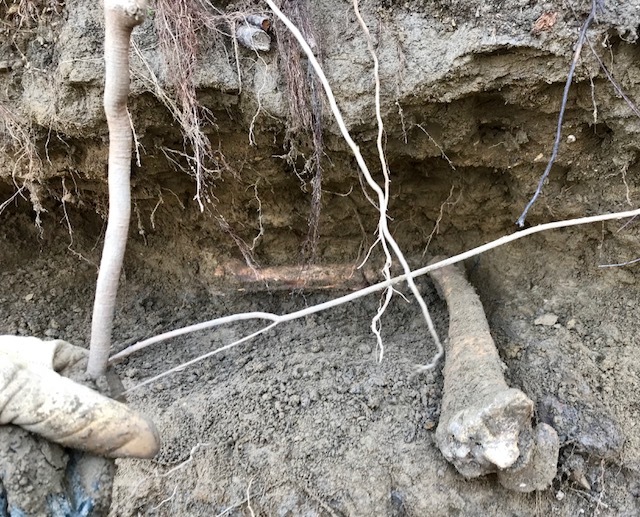 There was about a 3 foot (1meter) distance from the cavity where I dug for the scapula was to where the head of the tibia was. 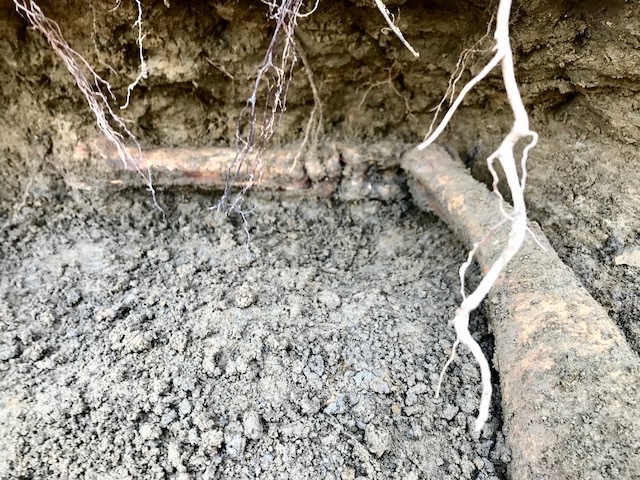 I kept having to widen the scapula cavity because a bone was running parallel to the bank about 20-24 inches back into the bank towards the tibia. There came a point where I told myself “Let’s just do this!” and I proceeded to tak out the whole 3 foot section between the tibia and scapula. The section was about a foot high or so by 3 feet long and about 2 feet deep (back into the bank). It was a lot of dirt. I am going to be sore tomorrow. My hands and forearms are already sore. I thought for sure I’d find bone in the front section, but didn’t find one sliver. However, there was a cool and big surprise waiting for me at the back of the cavity. I will leave that for tomorrow night though. I need to get to bed. Sorry about that. The upload issue delayed me for a while. There is 5 or more feet of bank above the bone layer. There are also trees up on top of the bank. I wish I were the type who had a bunch of buddies I could call in to help. I am actually pretty shy and almost always hunt alone. It is hard for me to break the ice. Once the ice is broken I am not really that shy. I'm coming down right now to help. I'll be there by noon. I'll call you when I get there. I'll bring food and beer. Such a cool find! Thanks for taking us along with you, Kim! LOL. I like the spontaneity and enthusiasm. I wish I had a buddy like that. I did invite a guy out to help, but he had to work. It may well be KimTexan could end up with bones from more than bison...not sure whether to cross or not cross my fingers on that one for good luck. So far most of it has been fairly well articulated. The thoracic vertebrae are the head scratcher to me. If the creek existed shortly after it’s death and water did some rearrangement of bones, the thoracic vertebrae would have had to have floated upstream and then flipped 180 from the rest of beasts body from the left side to the right. So far everything else seems to indicate the beast was laying on its left side. Everything besides the thoracic vertebrae have been oriented that way, besides the stuff that had fallen from the bank. That I cannot speak for its left to right position, but it was in relative articulation to where it should have been compared to what is in the bank. 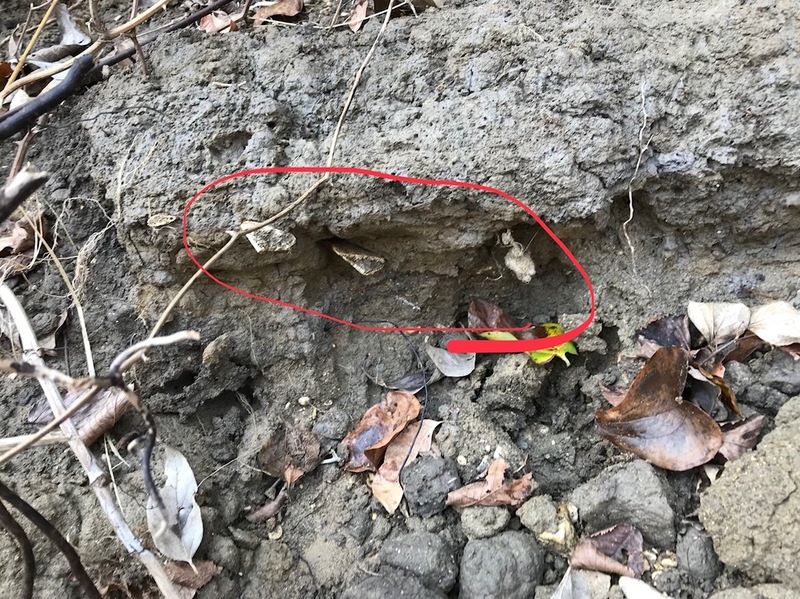 The place where I found the other jaw fragment was upstream about 40 feet, but off to the side in sort of a large dried out oxbow in the creek, that looks like it floods during heavy rain. These are some pretty cool finds I must say .......I wonder what an estimated age would be for these. You think on the order of 100s or 1000s of years? This is some textbook stream geomorphology at work!! It must have been buried on a flood plain or pointbar very long ago. As the river changes shape and direction it cuts back into its own flood deposits. Many years at work....had to be many 100s of years at least. Like you said it has still a lot of overburden with tree growth above. If it was mostly articulated like you said it had to have buried somewhat quickly.....flood!!! Really cool!! A lot of information can come from seemingly nothing. It’s prolly older (to us)...few thousand years? Maybe 1000-5000 years ago?? Large range I know but I don’t know enough so say anything other than the your description of the stream geomorphology would indicate something decently old to us mere humans. If things happened really fast maybe 500 years for a young guess? OK part 2 of yesterday's fossil collecting. So I had just decided to open up the 3 foot section between the scapula and tibia. I started on the scapula side and began to work towards the tibia. I said I didn't find a single sliver of bone, but as I was leveling it off and sweeping out the dirt I had broken loose I found a small bone. I didn't know what it was. I thought it was a fragment, but when I got it home and washed it up it was a whole bone. More on that later. I worked my way back from the back of the cavity where the scapula was all the way across to the end bottom end of the tibia. Then I began dusting the bones at the back off. I pulled the tibia clear and then it hit me what I was looking at. "Wow! So very cool!" I said to myself with a sense of awe and excitement. It was a fully articulated right rear leg of a bison. Everything appeared to be in place! I immediately put the tibia back in place so I could take pics. Before I removed the tibia it had not dawned on me that it was the leg bones fully and perfectly articulated. Wow! It was so very cool to see it all together like that. I had been finding the leg bones kind of piecemeal as they had eroded out of the bank or fallen out of it. I had found the humerus with the ulna in place, but I didn't really know what I was looking at then and it certainly wasn't the whole leg articulated. I am so sorry for the quality of the pic. I had been wearing gloves, but the gloves kept getting caked up like your boots do when walking in mud. So photography wasn't ideal at this point. I think I was so excited by it I wasn't fully paying attention either. I so wish I had gotten a clear pic of all of it there. You can see the tibia on the right, then some small bones followed by the metatarsal and then the feet bones and even both hooves. Here is a slightly better pic. I should have taken my little broom and swept them off, but I was afraid I would dislodge the small bones. Tibia on the right, calcaneus then the metatarsal. Same pic slightly different angle. This is better quality, but worse composition. The roots are in the way. I was holding one of them out of the way for the pic. Here is a close up of the bottom end of the tibia and the top end of the metatarsal with the talus and calcaneus in the middle with all the little tarsal bones. So cool!! I was so excited to see this laid out so perfectly. I am not even sure this is a bovine diagram. I typed in bovine talus and this came up as one of the pics. So you can get the idea that there are a number of small bones in this joint area. The calcaneus in humans is actually the back of the bottom of the heal on our feet. 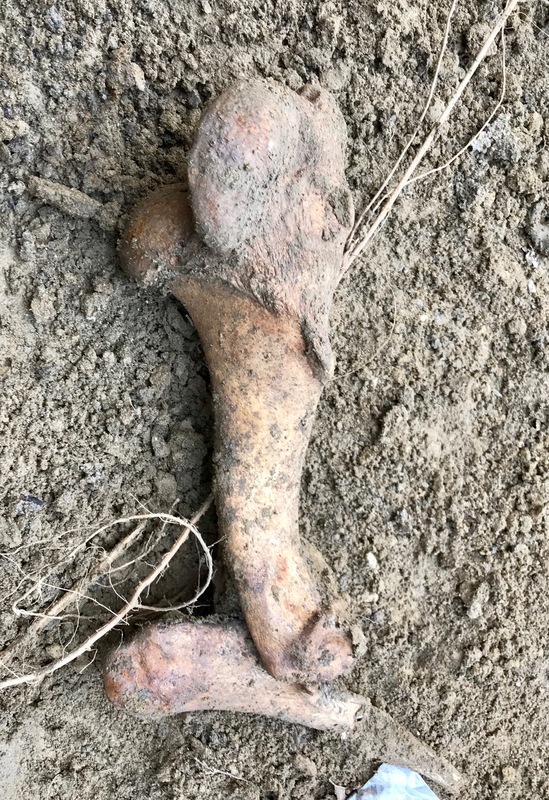 This is not in the cows foot, but more like ankle because there is the long metatarsal bone and then the feet bones of the bison. This one is hard to tell, but these are the sesamoid and phalanx bones. This is a diagram of what you can kind of see above. Sorry, I should have dusted them off better for pics. It was one of those once in a lifetime type pics and I kind of blew it with poor quality pics. I have more to say, but I'll put that in the next post. 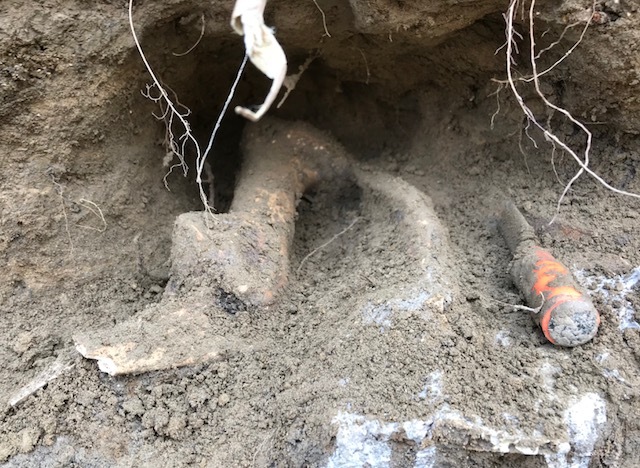 Finding the leg fully articulated like that was the highlight of the dig so far after finding it the first night and seeing the skull and all the vertebrae lined up, but even then pieces were missing. I have not figured out if any pieces are missing from the leg. I don't know if bovids actually have a fibula. If they do I don't think I have that, but I kind of think it may be fused somehow like the ulna and radius are. I'll post more in a bit. My theory is that it got bogged down in the mud. That is making many assumptions, but there is a spring there. I can't see the source of the spring, but last June when I first visited the creek it was close to 100 that day. The water in the creek was barely moving and was about the same temperature as the air. It was kind of miserable. I was melting in the heat. I was looking for a better exit from the creek since I entered going down a steep hill, through dense underbrush, poison ivy and green briars. I wanted a better exit. As I walked up stream in the hot water all of a sudden I stepped into cool, refreshing water. I stood there and splashed myself with it. I then proceeded upstream and came across the bones fallen from the bank about 10 feet from where the spring was. In June I thought it was a cow. I read up on the history of the area and determined that cows would likely have only been introduced into the area after the 1830s. Then it was largely land owned by railroad companies, but then later sold off I think around 1900. 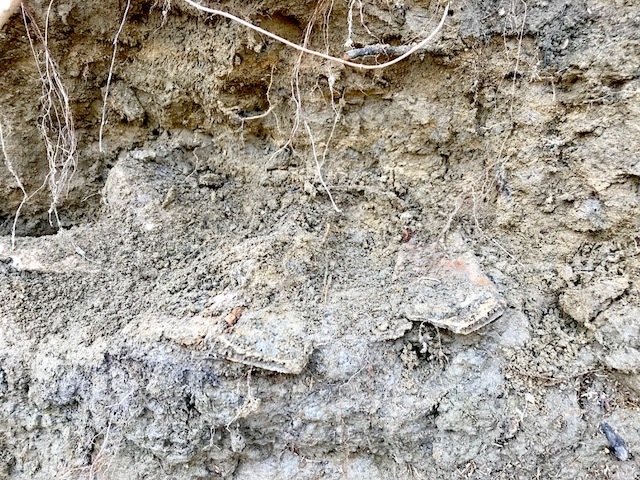 When I visited the Waco Mammoth site last month the Waco mammoths were found along the banks of a small creek in a flood plane. They also were only about 5 feet below the surface. 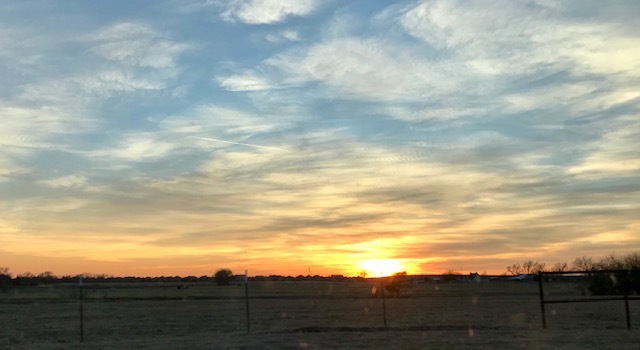 It is a lot of assuming to think that this environment has any similarities to the rate of soil deposition in Waco, but you can make something of a comparison. The strata looked similar to me, but I did not get a close up view or pic of it. I can only compare it to where I find Pleistocene bones in the North Sulfur River. 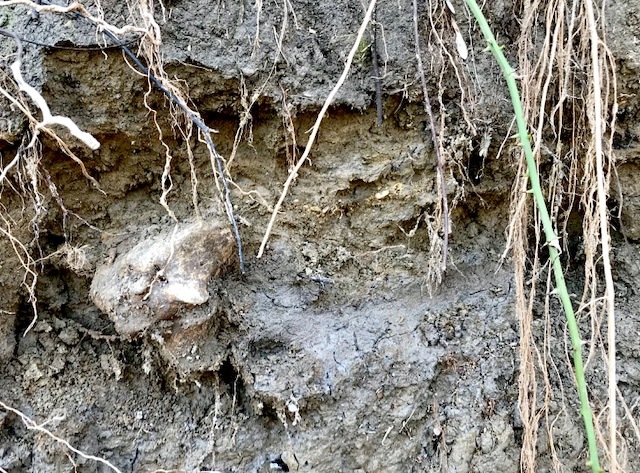 The Pleistocene bones usually are in the bank 5 feet down plus or minus about 2 when I have found them. Some are in the river or creeks, but you can see sometimes where the avalanche came from. 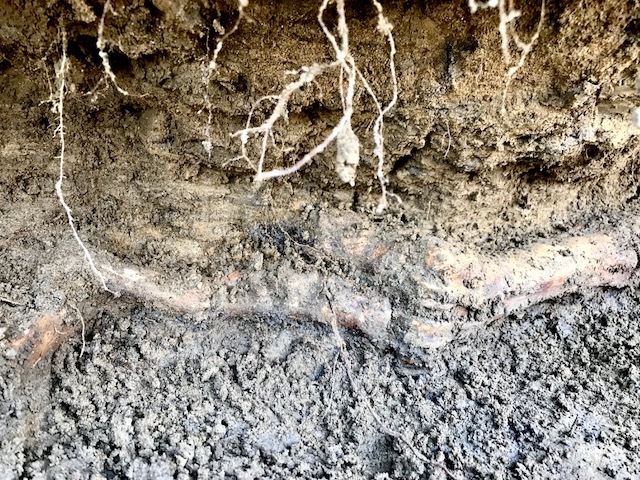 The layers where the bison are look similar in composition, but there is a little more clay component here and the soil is darker. There may be a bit more sand in this soil mix than what I usually see in the NSR. @Ptychodus04 does a lot of fossil prep for people in the area and otherwise. He lives in the DFW metroplex somewhere I believe. He said "Most late Pleistocene material is actually sub fossil bone. All bison that I have worked on have been this way and most mammoth material is as well." So, this could well be Pleistocene. Kim, this a great thread and you are doing well. Are you by chance sketching out a relatively accurate nine map while you excavate? This will be invaluable if you ever decide to mount this beast. You are definitely digging in Late Pleistocene deposits at the oldest. Anything in DFW that’s not Cretaceous is Pleistocene or recent and most of the Pleistocene stuff is in river deposits so seeing bones moved around should be expected. Judging from the matrix and the look of the bones in the photos, my inclination is Pleistocene rather than recent. After I got the leg and foot bones out I worked to get the other bone out. You can see part of it here in the last pic I posted of the bones. It is the red bone on the lower left of the pic. It was way back in the cavity as far as my arm could reach. I realized it was a rib bone. 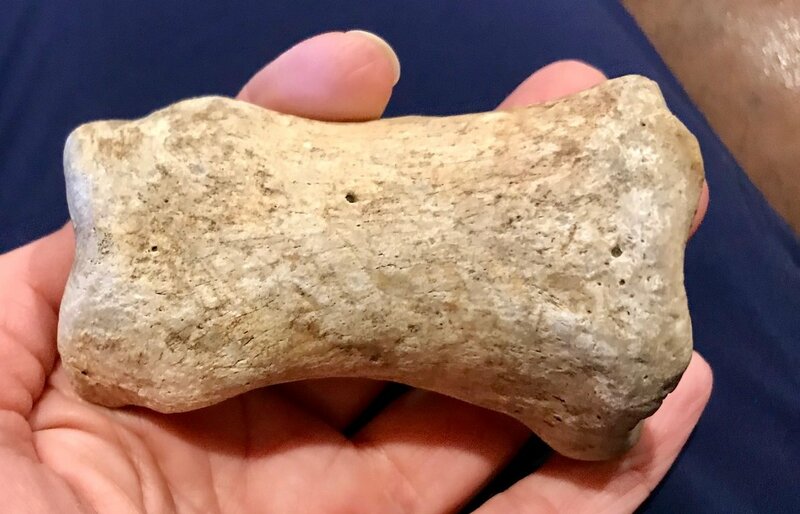 It is the only complete rib bone I recovered. I found many rib fragments, but not one complete rib, not even the broken pieces added up to whole ones. It appeared to be articulated with a lumbar vertebra that was too far back in the bank for me to extract. But at least I got me one whole rib. I am proud of my one whole rib. They are so thin and structured in a way that they are easy to break. They don't lay flat, so are more prone to being broken. Once I got the rib out I determined I was done and it was time to get the scapula pieces out. I had poured butvar 76 on them and let it set for maybe 3 hours, but it wasn't enough. I packed dirt on top of the scapula and packed it tight to try to hold the bone pieces in place. Then I wrapped them in foil. I pulled it out and then wrapped them 2 more times to hold it together better. Then I gently put it in my pack. I have accepted that the end of the scapula will probably be a lost cause with my limited prep experience and ability and my lack of patience with that sort of thing. I imagine that is upsetting for a paleontologist to hear, but it is what is is. I've got limited time out there. When I arrived yesterday there were fresh footprints to within 20-25 feet of where I was digging. They looked like child sized footprints in dress shoes (no tread). I imagine some kid had snuck away from the church on Sunday and come to the creek. I didn't see footprints by the dig site, but it told me the area had traffic. I have seen footprints there before. After I packed everything up I decide to have a short walk downstream. I walked out into the middle of the stream. I had seen this while I was digging. That is not a Texas size pecan folks. Everything may be bigger in Texas, but pecans don't get that big or hairy here. I can only wish they did. What state was I in again? Oh yes, Texas. Dallas area does not have coconut trees. 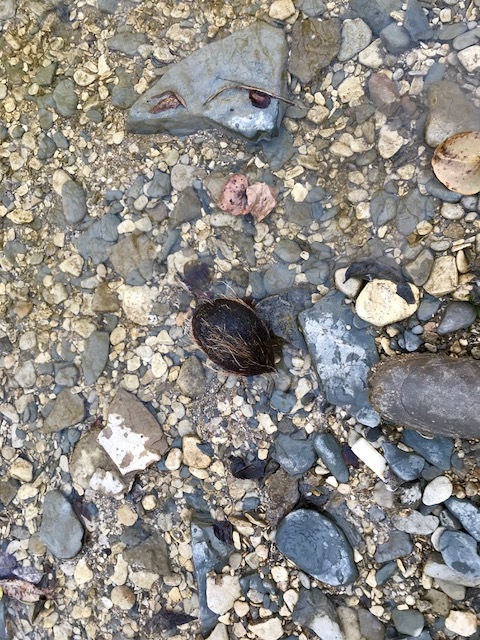 Nonetheless, there was a coconut sitting in the middle of the creek bed. I walked around part of the bank that was jutting out next to where I had been digging. I walked maybe 20 feet and saw a bone and picked it up. I don't think it was from my bison though, but I judge it must be partially mineralized based on its weight. It is fairly heavy for the little bone that it is. Here it is cleaned up a bit. I could be wrong, but it looks to be a radius of an artiodactyla (even toed ungulate) of some kind. Maybe a deer? If it is Pleistocene it could be a number of things. This creek was getting more and more interesting. So far I have only checked out maybe 300 meters max of it. 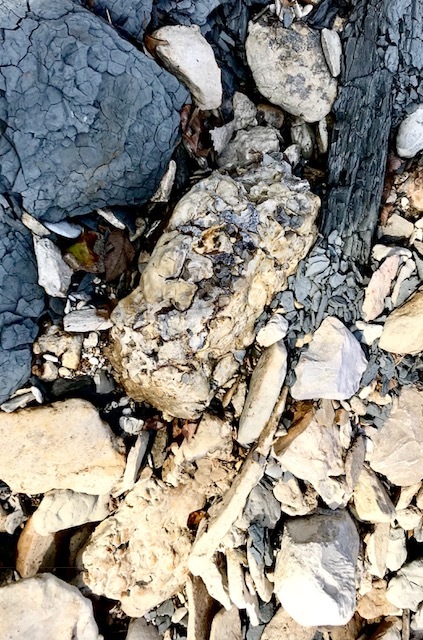 There are Cretaceous fossils in the creek. It is in the Eagle Ford group. I walked a few more feet and spotted another bone higher up on the bank. It had been exposed a while. It was whiter than the bones I had just exposed. It looked a bit like a phalanx bone maybe. It looks too big though. I will have to compare it to others bones I have to see if it is a match to any of them. I walked a few more feet and looked at the rocks in the creek. 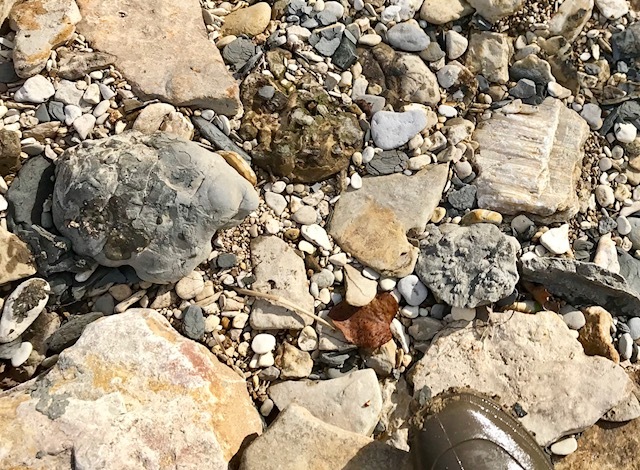 The creek is loaded with septarian nodules. Here is a pic with 3 of them lined up. Sorry the pic is a bit washed out. The big one in the middle and then one on each end of it is a septarian. They are all over the place. I think there are 2 or 3 in this one too, but I took the pic for the calcite on the top right. Tip of my boot is there for size. There is a lot of calcite in the creek too. The first time I was here I found the largest piece I have ever seen out hiking. It was 10-12 inches across and fairly translucent and almost a ball. 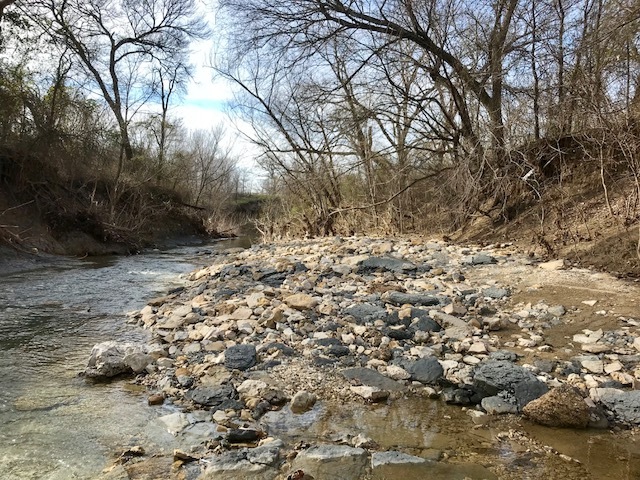 It has been creek tumbled for a while. I did not carry it out. It was too heavy. I tried. I thought it was pretty cool. Here is a pic of the creek. This is a pic of the sunset when I was driving home later. Sorry, I'm not the best photographer. I took it through my dirty window. I'll try to get most of the bones cleaned up tomorrow night and post pictures of them. Thank you very much Kris for that insight. I have thought it was Pleistocene, but I didn't trust my inexperience to make the official call. A "nine map"? Would that be site map with auto-correct? I am taking pics of almost every bone as I find it and listing what was found together. I have a lot more pics I have not posted for my documentation. So I have the association of bones with the others. It is easy to get excited and forget about taking pics though occasionally. I forgot to take a pic of the rib in situ. I take pics of the group found what day together so that I know what was found when. I have not taken pics of all the stray, non in situ bones as they lay when found. Some I have. You sure are being forced through this experience to learn a lot quickly, but it sure is worth it, ain't it?